I saw a link to these ruby eggs in YumSugar. 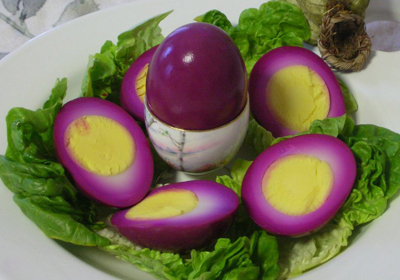 We have these back home in Pennsylvania, except they are called pickled eggs. They look freaky, but I like 'em. We had some for Easter dinner. They are pretty easy to make. They are just hard boiled eggs soaked in red beet juice. That's all. I guess "ruby eggs" sound nicer than "pickled eggs". I <3 pickled eggs! YUM! YUM! My Nana used to call these "red beet eggs", she was a real PA Dutchie. Do they TASTE pickley?? or just hard boiley?